Shabbychick Junk. : It's a whopper of an Easter! Hi everyone! Checking in tonite to show you what I'm up to tonite. The procrastinator here finally ran to Wal-Mart to pick up the little milk cartons of flavored Whoppers candy that I'm going to bring to my family's Easter gathering on Sunday. I love candy that comes in boxes because they can easily be altered by slapping some cardstock or patterned paper on them! 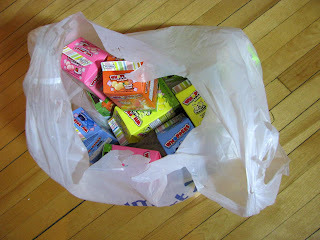 Did you guys know that Whoppers come in yummy new flavors like blueberry, vanilla, strawberry and ORANGE CREME? YUM! It made me happy that these boxes were bright and fun colors, which inspired me to pair this Doodlebug sparkly polka dot paper with it. 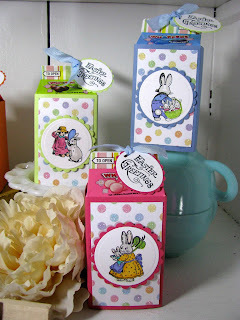 I found my Crafty Secrets Easter Joy stamp set that has been buried in a pile since CHA and pulled it out. Each box has a different little scene on it! 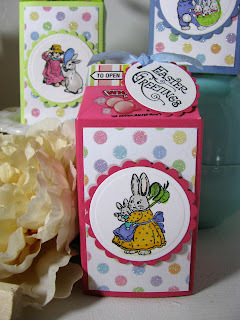 I chose the copic colors for the little bunny images based on the polka dot colors in the patterned paper, and then started cutting out circles and ovals with my Nestabilities dies. I am well on my way to finishing 15 of these babies; I'm done covering the boxes and am going to sit in front of the TV and color in my bunny images now. Easter greetings, everyone; have a whopper of a week!! These are so adorable! I love the springy colors. Love your clever ideas! This is just the cutest! HAve a wonderful Easter! That's a WHOPPER of an idea, LZ! They look great! You rock! 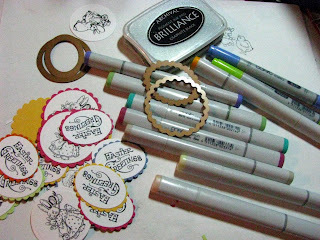 Ooh, love this idea! Your whopper boxes are too cute! P.S. 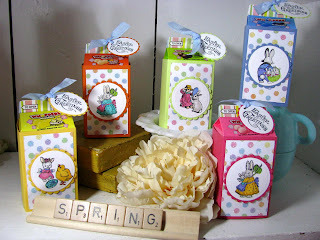 You're invited to come down to FL and visit me for Easter (you know you want to!). Bring a box of these, though. :) Hugs girlie!! darling little whopper boxes - I have some of those...wish I would have seen this earlier! Happy Easter!